Everyone makes New Year’s Resolutions. . .
Like so many truths, it’s funny mostly because it is true and sometimes the truth can make us defensive about our shortcomings, especially when we don’t live up to our own expectations. About this time last year, I chose 3 projects that I wanted to have completed by the end of the year. 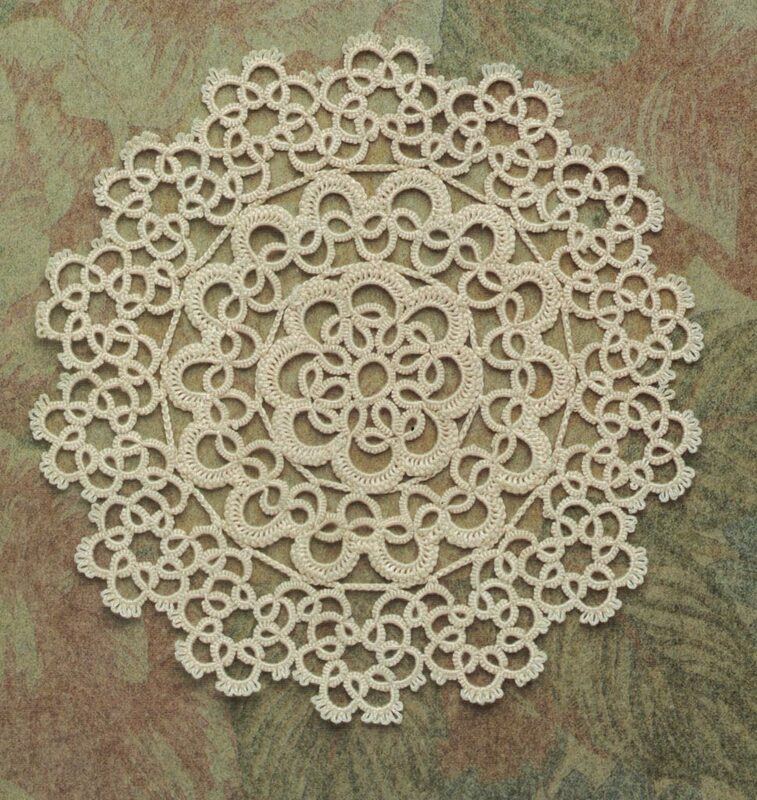 One is an “over blouse” in the book “Tatting by Burda” and another was a very intriguing pattern on page 132 of a book entitled “A New Twist on Tatting,” published in 1994 by Catherine Austin through Sterling/Chapelle publishers in New York. It’s a beautiful book with LOADS of tatted eye candy as well as images of other various types of lace. It is only about 1/2 filled with patterns, however which is somewhat of a shortcoming for a tatting book. 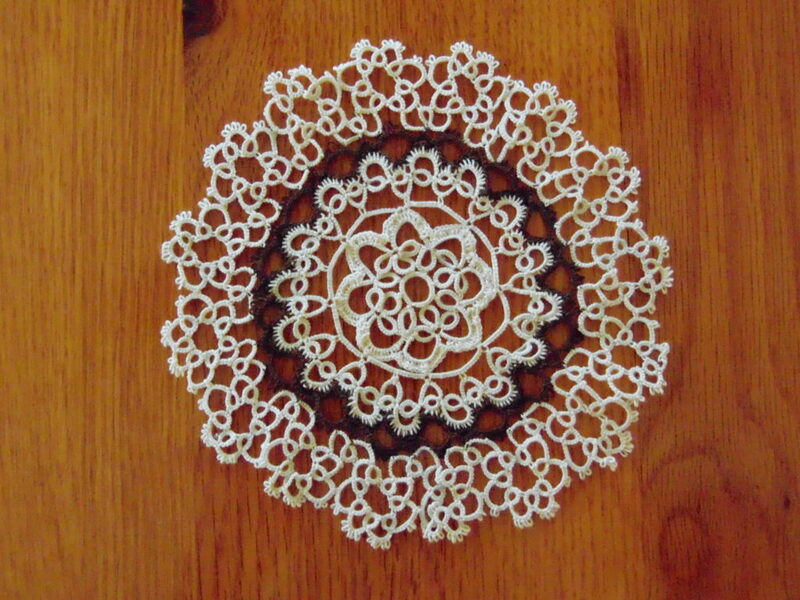 The instructions indicated that Schewe Fil D-Ecosse in size #16 thread was used to create a doily that was about 9 inches in diameter. Not being familiar with this sort thread, the only choice there seems to be is that it is a French Pearle Cotton. I chose to use some DMC Cebelia thread size 30 in the colors of Ecru and Dark Brown. Readers are probably aware by now that DMC Cebelia will no longer be being shipped to the states. There’s something in the heart of a tatter that seeks to modify a pattern. Partly it is the desire to create and partly it is the desire to personalize. This was no different in this case. If you will note that there are 2 rows, both just past the part of the pattern that is crocheted that are basically a chain that goes completely around the doily at these 2 places. In the pattern they are crocheted, but somehow I though that these would look better as tatted chains rather than crocheted ones. Naturally changing the technique changes the stitch count of the pattern after these rows, but that was just a hurdle I was determined to get across. Changing the color at the second crocheted round changed the character of the piece quite a bit. In fact the second crochet row is only barely visible as crochet at all. But it is a striking piece. AND it was finished the night before New Year’s Eve! Ta Daw!! 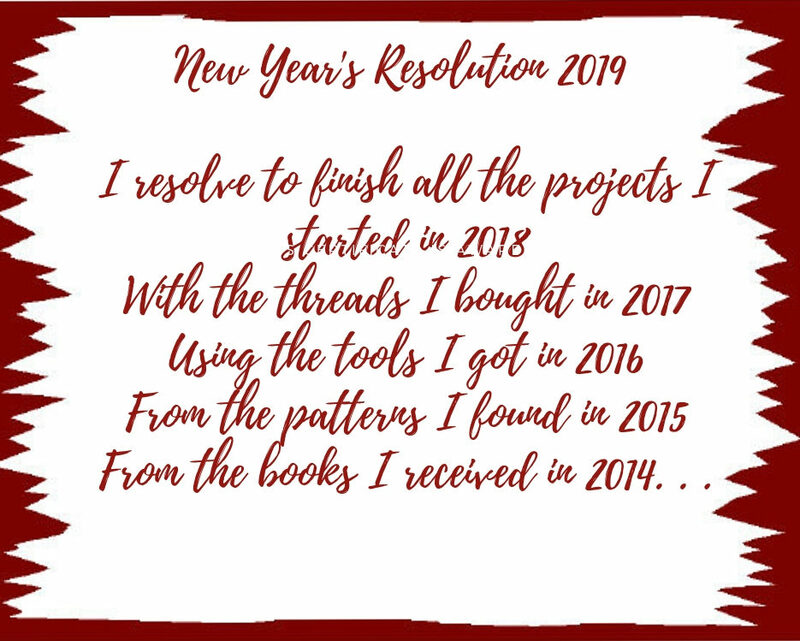 I’d love to see any pieces that readers have finished in 2018! Leave a comment and a link to your image or personal blog!